Our top tips for making the process as painless as possible. If you’re currently sporting a short crop, but find yourself dreaming of luscious, long hair, don’t worry, we’re willing to bet you’re not the only one. However, as we all too well, growing out short hair can be a bit of a nightmare, what with all those awkward in-between stages and constantly having to find new, inventive ways to style that funny-looking, grown-out fringe. But here at All Things Hair, we firmly believe that growing out short hair doesn’t have to be a tedious process. In fact, there are many styling ideas and nifty little tricks to keep your locks looking top-notch throughout the transition period – all of which we’ve listed below. Don’t forget to work in regular trims. You’ve probably heard this a thousand times over, yet you’re probably still not 100% convinced that it’s necessary. We know, it seems counter-intuitive, but we really can’t stress enough how important it is to work in regular trims when growing out short hair. Not only will this keep your locks looking neat and polished, but it’ll help keep split ends at bay, too. No one wants to end up with long, straggly hair at the end, right? If your hair is becoming unruly and unpredictable as you’re growing it out, why not try the totally on-trend slicked-back look? Spotted on several runways this spring/summer season – think Julien McDonald and Balmain – this look works particularly well on short hair and is perfect for the summer party season coming up. Not only will it help keep strayed strands and flyaways off your face, but this directional, occasion-worthy style is ideal for showing off your sartorial savvy, too. Try using a gel, like the VO5 Classic Styling Mega Hold Gel Spray, to give your hairstyle long-lasting hold. As for the weekends? Why not embrace one of this season’s hottest looks: the half-up, half-down bun. Not only is this easy-breezy updo suitable for short tresses, it’s also another great way to keep your hair off your face if it’s not quite long enough to tie up properly. When you’re growing out short hair, layers can present a bit of a problem – adding awkward and unwanted volume and movement in all the wrong places. 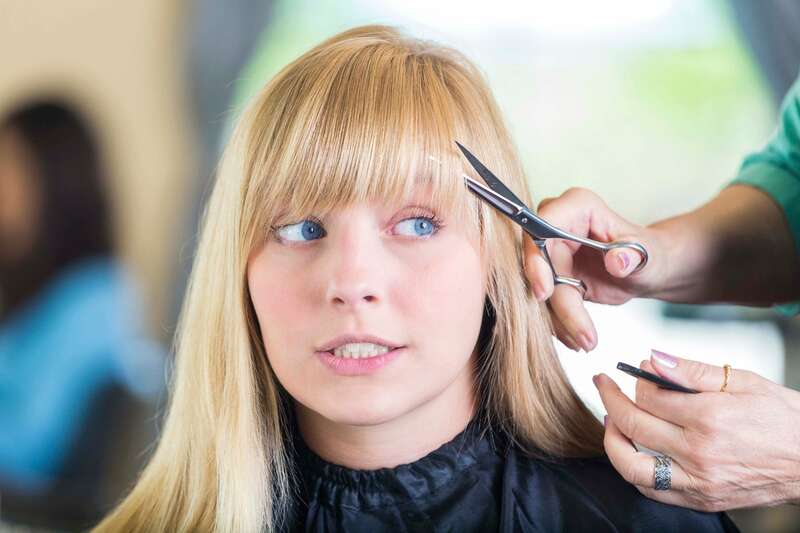 As soon as your hair’s just long enough, a blunt cut is the perfect solution to help ensure that your mane grows out evenly, providing the perfect base for your brand new ‘do! Soon enough, you’ll be sure to reach that in-between stage, where your hairstyle sort of qualifies for an unintentional lob. The best thing to do is to embrace it. Because didn’t you hear? The midi cut is all the rage this year. The only risk here is that you might love it so much, you end up wanting to keep it at this length forever! However, if you’re stuck for ways to style your long bob, have a read here for some inspiring ideas to keep you going until you reach that dream length. If you’ve tried absolutely everything and you can’t wait a minute longer for your short hair to be long, you can always turn to extensions for instant length (and volume!). However, if you do decide on this approach, it’s important that you consult a good stylist to ensure that you don’t end up damaging your hair as this will only slow the process down. Whether you’re trying to grow out a buzz cut, a pixie crop, or a short bob, we know, the process can seem long and arduous, which is why patience really is key. But trust us, all those days of looking in the mirror wondering if your hair’s grown even the tiniest bit will be totally worth it once you’re sporting your dream ‘do.